Polymer/graphene interfaces, for the design of novel materials with improved mechanical or electrical properties. Besides revealing structural aspects, we particularly focus on the development of modeling approaches for a deep understanding of the structure-properties relationships. NanoscaleInvestigation of the Electrical Properties in Semiconductor Polymer-CarbonNanotube Hybrid Materials. Desbief, N. Hergué, O. Douhéret, M. Surin, P.Dubois, Y. Geerts, R. Lazzaroni, P. Leclère. 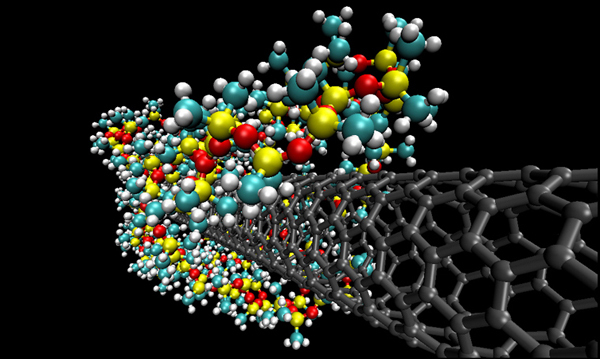 Molecular Modeling Study of the Structure andStability of Polymer/Carbon Nanotube Interfaces. A.Minoia, L. Chen, D. Beljonne, R. Lazzaroni. Azobenzene-BasedSupramolecular Polymers for Processing MWCNTs”. L.Maggini, T. Marangoni, B. Georges, J.M. Malicka, K. Yossaf, A. Minoia, R.Lazzaroni, N. Armaroli, D. Bonifazi. Nanoscale Insight into the ExfoliationMechanism of Graphene with Organic Dyes: Effect of Charge, Dipole, andMolecular Structure. A.Schlierf, H. Yang, E. Gebremedhn, E. Treossi, L.Ortolani, L. Chen, A. Minoia, V.Morandi, P. Samori, C. Casiraghi, D.Beljonne, V. Palermo.